The Workout app on the Apple Watch can be a useful tool in meeting your own personal fitness goals, and users report that it and the Watch's Activity app are helping them get healthier. The app has the ability to track your exercise while engaging in a number of different activities, including outdoor walking and running, and indoor gym activities such as using the elliptical machine, rower, or stair stepper. 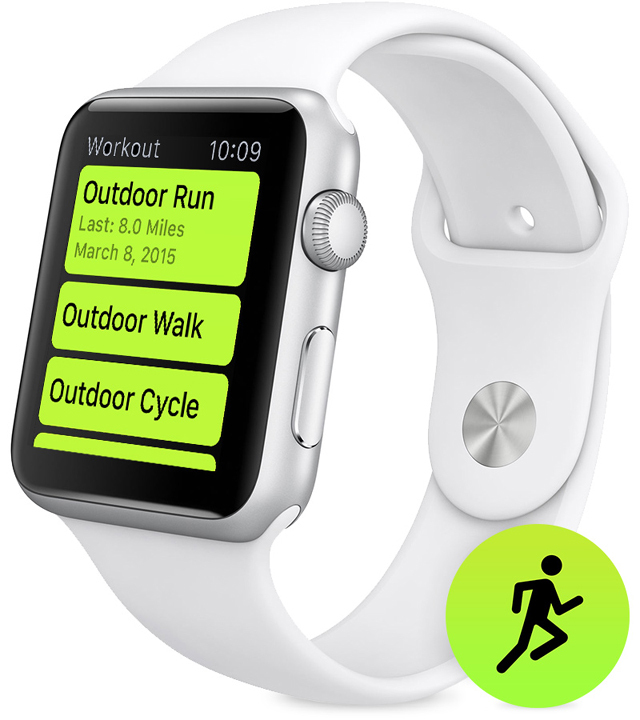 The Watch can also track walking and running indoors as well as both outdoor and stationary cycling. Using the Apple Watch to track your workout can not only give you a good idea of how that particular workout is going, but also give you a good idea of how your fitness is improving over time and what goals you should set for yourself in the future. Depending on type of workout you’ve selected, you’ll be prompted to set a goal of either time, distance, or calorie burn. During your workout,where you are in reaction to that goal will be displayed on the screen, so you know how far you’ve come and how far you have left to go. For some workouts you’ll also get additional prompts mis workout. For instance, when you’re walking or running with the app, the Watch will gently tap you on the wrist to let you know each time you’ve traveled another mile. It will also let you know when you’re halfway to your goal, and where you’ve completed it. When you bike, you’ll get that notification every 5 miles. If you’ve never used the Workout app on the Watch, getting started is fairly simple. 1. First you’ll want to open the app. the Workout app is represented by a green circle with a running man on it. 2. Select your desired workout from the available list. Tap o it to select it. 3. Swipe left or right to select what you would like to try and achieve from your workout. You can select between calorie burn, distance, or time. If you’ve done a particle workout before, then the app will display your previous stats. For instance, if you’ve already done an outdoor walk, then the app will show you what you did on your last walk as well as your all-time high, so you can set your goals appropriately. 4. Once you’ve set a goal, tap the Start button to begin your workout. The Watch will display a 3 second countdown before it starts tracking your movement specific to the workout. During a Workout, the Apple Watch will constantly track your heart rate. That’s great for a short jog around the block, but if you’re planning on undertaking a long afternoon bike ride or a longer workout then you might want to turn on the power saving mode on the watch. Everything else will work as normal, but the heart rate sensor will be turned off. Since the heart rate sensor uses a tremendous amount of battery power to operate, that means your Apple Watch will last a lot longer and won’t run out of juice mid run. You can activate Power Saving mode by going into the Glances menu on your watch and pressing the “Power Reserve” button on the screen that displays your Watch’s remaining battery power.